I thought that perhaps to defuse the tension a bit going on, we could have a thread discussing our families' histories in the World Wars, what with it being memorial day. My Grandfather on my dad's side has always been a mysterious figure in my family. He died when my own father was only sixteen years old. They never had a particularly great relationship and my dad never spoke of him apart from the occasional snippet. He once mentioned offhand that my Grandfather had fought in two wars, but that was all that I knew. The opportunity to learn more about him wouldn't come until my late teens, when at a family funeral I got the opportunity to talk to some older members of the family who had known him when he had been alive. My Grandfather in the early 1930s had been one of six brothers who lived near Cardiff, all members of various mining firms and shipbuilding firms. At the time that area of Wales was a breeding ground for radical socialists and other potential revolutionaries. The Industrial Revolution had brought wealth to Britain, but little of it had been passed into the hands of workers in Wales. Strikes led by strong trade unions and heavy handed police responses had been recurrent events in Wales, with Winston Churchill famously sending the troops in during the 1910s. It is perhaps no surprise then that my Grandfather and five of his brothers would go on to fight in the Spanish Civil War. In 1936, the Fascist General Franco declared a military coup and quickly moved to try and overthrow the left-wing coalition that was shakily holding on to power at the time. However the coup failed. Supporters of the democratically elected government took to the streets and repelled the uprising in large parts of the country, leading to a prolonged and bloody civil war. The religious tensions added a fanatical aspect to the war, with atrocities being committed on both sides. Around 200,000 people would die in executions during and after the war. The international community was divided over the response to the spiraling situation in Spain and ultimately the Western Democracies would offer little in the way of military aid to the embattled Republicans. 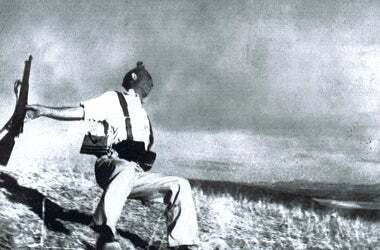 However when the call for international revolutionaries went up, over 40,000 men answered the call and joined the International Brigades. A motley mixture of intellectuals, writers, factory workers, committed communists and radical socialists, with some anarchists thrown in for good measure, they arrived in Spain in to fight the Nationalist forces. Very much against his Father's wishes, my Grandfather and his brothers would join these Brigades and help fight the fascist takeover of another European country, Italy and Germany already haven fallen earlier in the decade. My family knows little of what my Grandfather and his brothers actually did during the war. No letters survive and none of them talked much about their experiences after the war. We don't know whether they fought at the famous battles of Madrid, Corunna Road or Jarama, where the bulk of the British Battalion was destroyed in prolonged fighting. What they saw will remain a mystery. But two things are certain. First, that they lost the war. The Republican forces were hampered by division and a lack of military supplies. The Western Democracies operated on a non-interventionist policy, worried that to aid the Republicans would upset the delicate balance of appeasement, and so refused to send military aid. The Germans, Italians and Russians suffered no such compunctions and sent large amounts of aid to the fascists and the communists receptively. Famously, it would be the town of Guernica where the Condor legion of Germany would practice the art of civilian terror bombing they would utilise in the next war to great effect. By the end of 1938 it had become clear that the war was lost, and the International Brigades were disbanded and sent home. By 1939 the Republican lines crumbled and they surrendered unconditionally. Many of those remaining on the Republic side, including those who could not return to their home countries (for example, German volunteers), would suffer reprisals at the hands of Franco in years to come. The second certainty is that two of my Grandfather's brothers would not return home. Where they died is unknown and where they are now buried is again lost in the fog of war. But it is certain that they died, appearing on the Memorial role for the war. My Grandfather was blamed by his father for the loss of the two brothers, including the beloved youngest son, as he was the one who had persuaded them to join up with them. This estrangement would last for the rest of their lives and they wouldn't speak again. The father would not even turn up to the son's funeral twenty-five years later. The response to their return from the British public was not always welcoming either. Volunteers had technically broken international law and were viewed in some quarters as being dangerous malcontents, who might have dragged us into a second world war so soon after the bloodbath of the first. Recognition of their valour would come in later years, when the Spanish Civil War came to be seen as a precursor of that greater war. Opinion would slowly come to see these men as being the first to take up the fight against a monstrous ideal. A memorial now stands in the centre of London dedicated to those who fell, including my family. I haven't seen it in person. Perhaps some day. Everyone knows the history of the Second World War, so it is unnecessary to go into the details of how that war started. My Grandfather again took up arms, perhaps seeking vengeance for the lost war in Spain, but this time he would not be a foot slogger. One of the few things he said about the Spanish war was that "Infantry is a fools game and involves too much bloody walking". Perhaps it was this sentiment that led him to join Bomber Command early in the war. Or perhaps it was seeing the destruction of Guernica that persuaded him that the future of war was in the air. Perhaps he just enjoyed the irony of a socialist bombing the country that had supplied the air power that had done so much to turn the tide of the Spanish war. A family legend says that he used to sing The Internationale on bombing runs. I'm not sure whether this is true or not, part of me thinks it too unlikely, but it makes for a hell of a story. Over 12,000 Bomber Aircraft and 55,500 Crew members would be killed during action, the highest attrition rate out of any British Unit in the war. No campaign medals were ever stuck for Bomber Command, unlike every other unit and no memorial built until 2012. I do not wish to get involved in a prolonged discussion of whether or not civilian bombings constituted a war crime. I am of the opinion that they were and that Dresden, Hamburg and the rest should be remembered alongside Hiroshima and Nagasaki. They were all products of a war that, much like the Spanish Civil War, descended into brutality and moral grey-areas, even for the 'good guys'. I have just always found it a shame that my Grandfather who fought in two wars, would not be honored for either of them until after his death. He would go on to father three of his own children and died of terminal throat cancer from a smoking habit he picked up during the war. A final irony that a man that survived the best efforts of the Falangists and Nazi's would be killed by cigarettes. Franco would be dictator of Spain until his death in 1975 and his regime is estimated to have killed between 200,000 and 400,000 people during his reign. Please share your stories below. Note that while my post is mainly about the World Wars, please feel free to share any stories you may have. Let's please try and be civil and not turn this into a flame war.